The 8 Universal Time Principles - Vcehelp - Dare To Dream And Achieve Your Goals With VCE Help. In both my personal and professional life I have always tried new ways to improve my efficiency and effectiveness. What I have learned along the way is that we all are at the mercy of these 8 universal time principles. It is a timely reminder that time is running out as we head towards the end of the vce school year. 2. You will always spend your time doing what you "Value" the most. Whatever you value doing, whether it be playing computer games, catching up with friends all night or studying, your values hierarchy (the order in which your values stack up) determines what you will end up doing. For example if the value of learning is lower than your value of spending time with friends, which is very high when you are presented with a choice between learning/studying and spending time with friends, chances are you will end up spending more time with your friends than sitting down and doing study. So how do you get around it? Try thinking about why you are studying. Apart from just attaining your vce why else are you studying? Keep in mind that attaining a specified enter score is irrelevant if you don't know why you want it and what courses it will get you into. 3. Disorganized people complete insignificant, unimportant and urgent tasks first. Such as answer phones, watching too much tv, excessive talking with friends while the important tasks such studying, working towards goals and building relationships come last. It is often said that these people "Major in minor things" to quote stephen covey from the book the 7 habits of highly effective people. 4. Organized people employ the strategy of daily planning and working on important tasks first. This leads them to personal success, builds self-esteem and instills confidence in utilising goals and goal setting.This leads to the achievement of your ultimate goals, moves you towards inner peace and personal happiness. 5. “busy-ness” is not an indication of effectiveness. 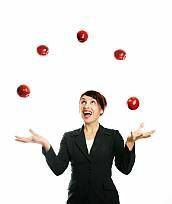 Sometimes the busiest people are those who “paper-shuffle” endlessly and perform the unimportant tasks first at the mercy of the important tasks they know they should be doing. The phrase “if you want something done give it to a busy person” is not always true. 6. The "One and a half rule" applies to work completion for the novice time master. What ever time-frame you give yourself to complete a task add half of the allocated time to give a more realistic time frame for completion. In all my experience, if you take into account the occasional disruption, a toilet break, thinking time (or a computer malfunction), you easily take 1.5 times the allocated time to complete a task. With experience you are able to better judge work completion times. Time-masters who apply this rule find that they complete tasks on time, are more relaxed and less stressed out by work and have more confidence in work completion within the set time-frame. They also tend to have a better ability to say “no” to the unimportant or could-do tasks. 7. Procrastination is the art of putting off today what you can do tomorrow. The smallest of excuses stops you from following through by conveniently leaving until tomorrow. When you give in and give up once it becomes easier to lose your resolve and procrastinate. Procrastination is one of the biggest momentum breakers you will face on your way to success. The support structures that strengthen procrastination are a lack of purpose/vision/goal, poor long-term thinking, short-term gratification, failing to persist through challenges as well as poor focus and concentration on the task which leads to distractions galore. 8. ...And lastly time thieves. These are the activities that steal time from us without our awareness and are always present in our lives. The trick is to minimise their impact but identifying what they are and deliberately avoiding them.